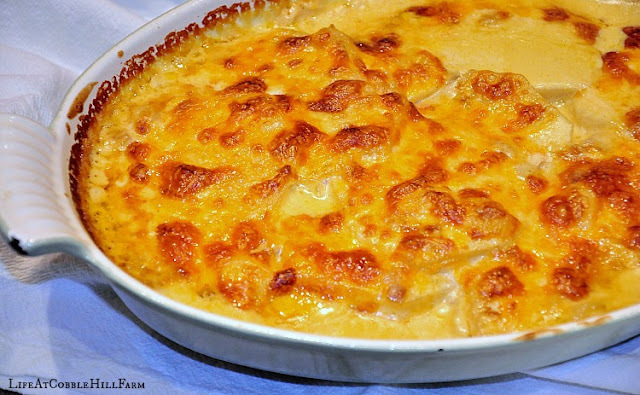 A creamy cheese sauce paired with perfectly cooked potatoes equals the ULTIMATE comfort food. 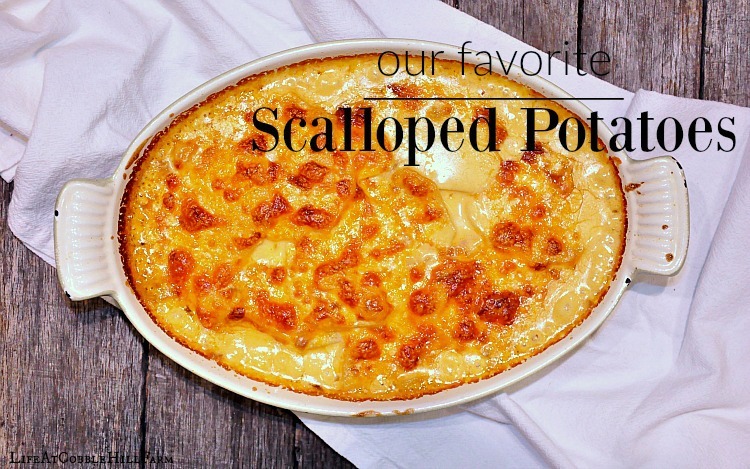 Add to that this is easy to make and, oh my, it is the perfect side dish! Melt the butter in a dutch oven over medium heat. Add onion and cook until softened. Add thyme, garlic, salt and pepper and cook about 30 seconds, until fragrant. Add potatoes, stock, cream and bay leaves. Bring to a simmer. Reduce heat to medium-low, cover and simmer 10 minutes. Discard bay leaves. Mix 1/2 cup of the cheddar into the potato mixture. Transfer the mixture to a dish (8" baking dish works well) and sprinkle the remaining cheddar over the top. Bake 15-20 minutes, until cream is bubbling around the edges and the top is browned. Cool for about 10 minutes before serving. Hi there - I'm Staci. My husband and I pulled ourselves out of debt (mostly by meal planning/creating an awesome grocery budget plan), learned to live by a budget, changed our eating habits, and simplified our lives. I want to help you do the same! I share the tools we used (and still use) to succeed on our path to creating a life we love. Welcome!! Cage Free? Natural? Free Range? What Does My Egg Label Mean? Visit Staci @ Life At Cobble Hill Farm 's profile on Pinterest. Many of the links on this blog are affiliate links. LifeAtCobbleHillFarm.com receives a small commission when certain items are purchased at no additional cost to you. LifeAtCobbleHillFarm.com is a participant in the Amazon Services LLC Associates Program, an affiliate advertising program designed to provide a means for sites to earn advertising fees by advertising and linking to amazon.com. The information on this website is provided for informational and entertainment purposes only and is not intended to substitute for obtaining professional financial and/or medical advice. The information on this website has not been evaluated by the FDA and is not intended to diagnose, treat, prevent or cure any disease. Nothing on this website implies a consulting or coaching relationship. Life At Cobble Hill Farm is not liable for how the information is used and cannot be held responsible or guarantee any results. Join us in cultivating a life you love! Sign-up to have posts and additional content delivered right to your inbox! No spam, unsubscribe at any time!